Liverpool took a huge step towards winning the Premier League title by beating Manchester City as Anfield marked the 25th anniversary of the Hillsborough disaster. The Reds looked like sweeping City aside in a dazzling opening half as goals from Raheem Sterling and Martin Skrtel put Brendan Rodgers's team in complete command. City, who lost Yaya Toure to injury early on, mounted a superb recovery and David Silva pulled one back early in the second half before his cross was deflected in off Glen Johnson and Liverpool keeper Simon Mignolet to draw them level five minutes later. A gripping spectacle was decided 12 minutes from time when City captain Vincent Kompany - an injury doubt before the game and clearly lacking some of his familiar authority - sliced a clearance straight to Philippe Coutinho, who shot low and unerringly past Joe Hart to put Liverpool in control of the title race. It set up a nail-biting finish in which Liverpool's Jordan Henderson was shown a straight red card for a late challenge on Samir Nasri, one which means he will miss three of the last four games, and referee Mark Clattenburg missed Skrtel's clear handball in the closing seconds. The final whistle sounded seconds later and a wall of noise surrounded Anfield as Reds players gathered in a huddle in front of the Kop, four wins away from their first title since 1990. If Liverpool win those games they will be champions, but Chelsea also have to visit Liverpool and there is every chance they will still be harbouring Premier League title ambitions of their own. City's impressive second-half showing demonstrated they must not be ruled out and they left Anfield nursing a sense of injustice, also believing Luis Suarez should have been sent off when Clattenburg declined to give him a second yellow card for diving. None of this will matter to the Reds, who were simply breathtaking in the opening 45 minutes as they made it 10 league wins in succession. City had an injury doubt surrounding captain Kompany before kick-off after he limped out of training on Saturday. He underwent a lengthy warm-up on his own after being named on the team sheet and was fit to play. Liverpool's lightning starts have become their trademark and they were at it again as Sterling gave them the lead after six minutes. Suarez, who had already been booked for a late challenge on Martin Demichelis, played a perfect pass into Sterling, who showed commendable coolness to wait and wrong-foot Kompany and Hart before scoring in front of an ecstatic Kop. And to make matters worse, Toure pulled up sharply with a muscle injury after attempting a long-range shot, struggling for a few minutes before accepting the inevitable and being replaced by Javi Garcia. The hosts were overwhelming City with their pace, pressing and movement and should have extended their lead when Sterling set up Daniel Sturridge, only for the striker to glide a finish wide from eight yards. "What a result for Liverpool. Drama like nowhere else. You would almost think that this was the day the title was decided but there will be more stories to tell before the end of the season. They had it won, gave it away and had to win it all over again." The only complaint Rodgers could have had was that his team were not further ahead - but that situation was remedied as they scored a second after 26 minutes. City's suspect marking at set-pieces allowed Gerrard a free header, which forced a magnificent one-handed save from Hart. It kept Liverpool at bay for a matter of seconds as Gerrard swung over the resulting corner and Skrtel rose at the near post to head in. Finally, City showed signs of life as half-time approached and Mamadou Sakho was very fortunate to escape with a reckless lunge on Edin Dzeko in the area. As Liverpool's pace relented briefly, the tiny figure of Sterling rose to head Kompany's header off the line before Mignolet did very well to plunge and turn away a snapshot from Fernandinho. There was a very contentious moment early in the second half when Suarez went down theatrically with, at best, minimal contact from Demichelis. Referee Clattenburg gave no foul and City immediately questioned why Suarez had not been given a second yellow card for diving. City were a team transformed after the break, with the introduction of James Milner for Jesus Navas a contributing factor. He helped Silva pull one back when his run and cross gave the Spaniard a close-range finish. And as the Merseysiders suddenly rocked, matters were level five minutes later when Silva's cross went in via a touch off Johnson and the legs of Mignolet. Sensing the shift in momentum, City manager Manuel Pellegrini introduced Sergio Aguero for Dzeko and he almost set up a third for Silva, who just had to stretch too far to reach the pass and shot just wide. Liverpool made City pay with 12 minutes left when Kompany's sliced clearance fell to Coutinho, who sent a low finish past the stretching Hart. In a frantic finish, Henderson was sent off and Skrtel escaped with a handball - but nothing could dampen the celebrations that swept around Anfield. Match ends, Liverpool 3, Manchester City 2. Second Half ends, Liverpool 3, Manchester City 2. Substitution, Liverpool. Lucas Leiva replaces Raheem Sterling. Hand ball by Pablo Zabaleta (Manchester City). Jordan Henderson (Liverpool) is shown the red card. Corner, Manchester City. Conceded by Martin Skrtel. Offside, Liverpool. Raheem Sterling tries a through ball, but Luis Suarez is caught offside. Offside, Manchester City. Vincent Kompany tries a through ball, but Samir Nasri is caught offside. Offside, Liverpool. Joe Allen tries a through ball, but Luis Suarez is caught offside. Attempt saved. Martín Demichelis (Manchester City) header from the centre of the box is saved in the bottom left corner. Assisted by James Milner with a cross. Corner, Manchester City. Conceded by Steven Gerrard. Corner, Manchester City. Conceded by Jon Flanagan. Goal! Liverpool 3, Manchester City 2. 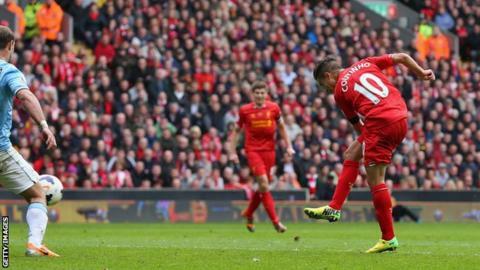 Philippe Coutinho (Liverpool) right footed shot from the centre of the box to the bottom right corner. Pablo Zabaleta (Manchester City) is shown the yellow card. Attempt missed. David Silva (Manchester City) right footed shot from the centre of the box is close, but misses to the right. Assisted by Sergio Agüero with a through ball. Offside, Liverpool. Jon Flanagan tries a through ball, but Jordan Henderson is caught offside. Substitution, Manchester City. Sergio Agüero replaces Edin Dzeko. Attempt missed. Samir Nasri (Manchester City) right footed shot from outside the box is close, but misses to the right. Assisted by David Silva. Attempt saved. Edin Dzeko (Manchester City) left footed shot from the left side of the box is saved in the centre of the goal. Substitution, Liverpool. Joe Allen replaces Daniel Sturridge because of an injury. Own Goal by Glen Johnson, Liverpool. Liverpool 2, Manchester City 2. Attempt blocked. David Silva (Manchester City) left footed shot from outside the box is blocked. Assisted by Martín Demichelis. Goal! Liverpool 2, Manchester City 1. David Silva (Manchester City) left footed shot from the centre of the box to the bottom left corner. Assisted by James Milner.